It is a good general rule never to leave the soil uncovered. Wind, rain and extremes of temperature can all affect its structure, and bare soil will, in any case, be rapidly covered with weeds. If the ground is not producing a crop then it can be sown with a green manure or mulched. A mulch is basically a cover for the soil. It can be inert, such as carpet or plastic, or “live” such as a layer of compost or manure, hay, or straw. The advantage of live mulches is that they will feed the soil. Even hay and straw will gradually rot down. Unless they are applied very thickly they will not be completely light-excluding and the most vigorous of the perennial weeds, such as docks, may come through. However, these individuals are easily removed. Mulches can insulate the ground from heat and cold, or from excessive rain, it is important to put them on when the soil is in the condition that you want to maintain. So the soil must be reasonably moist to start off with, and must not be cold. Add them once the soil has warmed up in spring. If plastic is to be left on and planted through, then watering will have to be directed through the planting slits or by means of a seep-hose underneath. 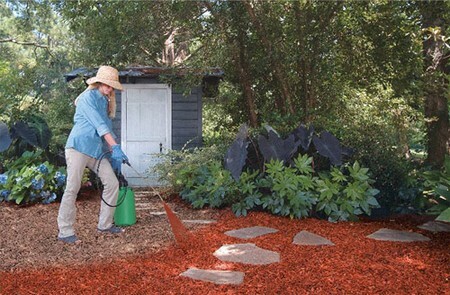 Woven plastic mulches are also available, and these suppress weeds but are permeable to rain. Carpet is also suitable for permanent ground cover on paths, for example, and can be covered with bark or chippings for appearance. Cardboard and newspaper are the cheapest of the inert mulches and will eventually rot in, but don’t use glossy papers because of the chemical print. A thick layer of paper will be needed and can be covered with bark or straw to keep it down and to improve the appearance. Of the live mulches the best would be compost or manure. Leaf mould is low in nutrients but is good for suppressing weeds and increasing the moisture retentiveness of the soil. Live mulches that have not been composted will cause nitrogen robbery if dug in—nitrogen is needed for the breakdown process—so hay, straw and bark need to be left as a surface mulch. However they will gradually rot down on their own and the worms will pull in the composted material. Transgenic organisms found in GM crops can introduce new allergens into our food and can cross-pollinate with wild plants to create superweeds.